In July 2018 Jurj Holly makes his debut as DON OTTAVIO in Don Giovanni at the Mannheim National Theatre. In the season 2018/19 he makes his debut here as DUCA in Rigoletto and as PRINCE in The Love for the 3 Oranges. In the season 2017/18 the likeable tenor is a member of the Lubeck Theatre, where he can be seen in such roles as TAMINO in Die Zauberflöte, CASSIO in Otello and ALMAVIVA in Il barbieri di Siviglia. This very role he sings this season once again at the Bratislava National Opera. In summer 2016 Juraj Hollý enjoyed great success as LENSKI at the Zomeopera Alden Biesen in Belgium. In the Season 2013/14 he became a a member of the Koblenz Theatre, where he was outstanding in TAMINO, CONTE ALMAVIVA in Rossini'sIl Barbiere di Siviglia, ALFRED in Die Fledermaus,NARRABOTH or NEMORINO. Lately, he was succesful as CONTE ALMAVIVA and TAMINO at the Prague National Opera and in Bratislava and as FERRANDO in Cosi fan tutte at the Banská Bystrica State Opera. The artist was a member of the international Opera studio at the Cologne Opera House, where he sang such roles as the PRINCE in Wolf-Ferrari's La Cenerentola and the FIRST PRISONER in Fidelio. The young tenor also has experience with conteporary music: he was HAROLD MITCHELL in Prévin's A Streetcar named Desireas and COUNT APIANI in the world premiere of Marijn Simon's Emilia Galotti. Juraj Hollý studied singing with Gurgen Ovsepian at the Music Accademy in Bratislava, where he also appeared as DON OTTAVIO. In 2010 he was awarded with the 1. Prize at the International Antonín Dvořák Singing Competition in Karlovy Vary as well as the Special Prize at the Hans Gabor Belvedere Competition in Vienna. Additionaly, he was finalist at the Pietro Antonio Cesti Competition in Innsbruck and he won the 1. Prizeat the Mozart Competition in Prague. After graduating he made his debut as GERNANDO in Haydn's L'isola disabitata at the Vienna Chamber Opera and was the ANGEL OF DEATH in J. N. Hummel's opera Crossing the red sea. In 2011 he appeared as BARDOLFO at the Ostrava National Opera and as PAOLO MONTI in J. Poniatowski's opera Pierre de Medicis at theFestival of Polnish Music. He sang the title part in Franz Liszt's DON SANCHE at the Concertgebouw Amsterdam - Placido Domingo conducting -. As a concert singer, Juraj Hollý has been invited to sing Mozart's Requiem in Germany, Japan and Singapur. In autumn 2016 Hollý made his Japan-debut as TAMINO in Mozart's Die Zauberflöte in a Tour with the Czech National Opera of Prague,performing in Yokohama, Tsukuba and Morioka. In spring 2017 he was the CONTE ALMAVIVA in il barbieri di Siviglia at the Opera Zuid and the Concertgebouw Amsterdam. Outstanding singer Juraj Holly Also in the national theatre’s revival of the play this prince plays a key role. In this performance Juraj Holly absolutely stands out. It is a pleasure to watch him working his way up to queerly beautiful exuberance and showing some true tenoral verve in the face of his princess. Vocally, Juraj Hollý was in no way a faint Ottavio. His elegant legato in „Il mio tesoro intanto” together with his perfect lyrical vocal colour were really captivating. 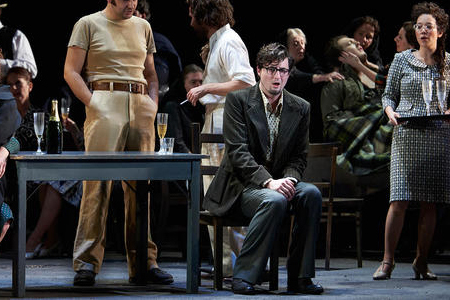 Also Juraj Hollý dgave a fine portrayal of Cassio as a drunk man, who feels used and deceived by Jago. Cassio (Juraj Hollý excellently sung, especially the drunk scene). Also very impressive the tenor Juraj Holly as the roasted swan, that sings about its destiny. The ballad of a roasted swan, that complaints in shrill tones about hits destiny. Juraj Holly did so with dedication. ..Lenski's aria, beautifully performed by Juraj Hollý .... tenor who just sang fantastically this night. As a singer Juraj Hollý makes a great impression both vocally and visually. And finally Juraj Hollý as Freddy, whose in love with Eliza. From his costume, one could get the impression, he walked right out of a Tim Burton movie. Vocally, the excellent opera tenor sounds like the young Karel Gott - a really great performance.